Last time article was about handover based on X2 interface but without SGW change, that is why it's time to deal with X2 based handover with SGW relocation. All of this information you can find by reading 3GPP TS 23.401. Today as usually we will start with a high level of abstract picture. Please see below. As you can see Fig. 1. is almost the same as it was in X2 based handover, where the green arrow was demonstrating the case we talked about last time (if interested you can read about it here) where was no need to change SGW. Today we are interested in case illustrated by blue (azure? blueish?) arrow. Where handover is done bye X2 interface with SGW relocation. Lines that are green, between UE and eNB, showing changed path on the end of handover operation without SGW change. Blue lines between UE, eNB, MME and new SGW are showing new path after changing old SGW to new. Fig. 1. UE is moving from old to new RAN coverage provided by eNodeB. Before we will jump into detailed description of handover few general information about X2 interface based handover. Fig. 2. X2-based handover with Serving GW relocation. Step 1. The target eNodeB sends a Path Switch Request message to MME to inform that the UE has changed cell, including the ECGI of the target cell and the list of EPS bearers to be switched. The MME determines that the Serving GW is relocated and selects a new Serving GW. NOTE: The MME knows the SGW Service Area with a TA granularity. Step 2. The MME sends a Create Session Request (bearer context(s) with PDN GW addresses and TEIDs (for GTP-based S5/S8) or GRE keys (for PMIP-based S5/S8) at the PDN GW(s) for uplink traffic, eNodeB address(es) and TEIDs for downlink user plane for the accepted EPS bearers, the Protocol Type over S5/S8, UE Time Zone) message per PDN connection to the target SGW for each PDN connection where the default bearer has been accepted by the target eNodeB. The target Serving GW allocates the SGW addresses and TEIDs for the uplink traffic on S1-U interface (one TEID per bearer). The Protocol Type over S5/S8 is provided to SGW which protocol should be used over S5/S8 interface. If the PGW requested UE's location info, the MME also includes the User Location Information IE in this message. The MME uses the list of EPS bearers to be switched, received in step 1, to determine whether any dedicated EPS bearers in the UE context have not been accepted by the target eNodeB. The MME releases the non-accepted dedicated bearers by triggering the bearer release procedure via target SGW. If the SGW receives a DL packet for a non-accepted bearer, the SGW drops the DL packet and does not send a Downlink Data Notification to the MME. 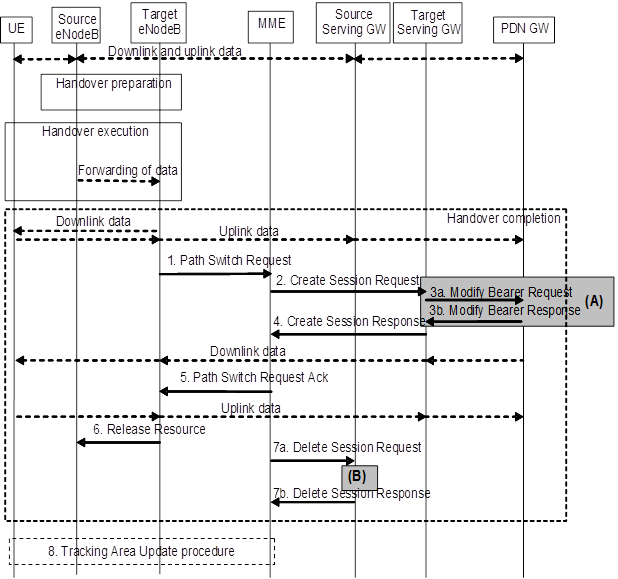 If the default bearer of a PDN connection has not been accepted by the target eNodeB and there are multiple PDN connections active, the MME shall consider all bearers of that PDN connection as failed and release that PDN connection by triggering the MME requested PDN disconnection procedure via source SGW. If none of the default EPS bearers have been accepted by the target eNodeB, the MME shall act as specified in step 5. Step 3. The target Serving GW assigns addresses and TEIDs (one per bearer) for downlink traffic from the PDN GW. The Serving GW allocates DL TEIDs on S5/S8 even for non-accepted bearers. It sends a Modify Bearer Request (Serving GW addresses for user plane and TEID(s)) message per PDN connection to the PDN GW(s). The SGW also includes User Location Information IE and/or UE Time Zone IE if it is present in step 2. The PDN GW updates its context field and returns a Modify Bearer Response (Charging Id, MSISDN, etc.) message to the Serving GW. The MSISDN is included if the PDN GW has it stored in its UE context. The PDN GW starts sending downlink packets to the target GW using the newly received address and TEIDs. These downlink packets will use the new downlink path via the target Serving GW to the target eNodeB. The Serving GW shall allocate TEIDs for the failed bearers and inform to the MME. Step 4. The target Serving GW sends a Create Session Response (Serving GW addresses and uplink TEID(s) for user plane) message back to the target MME. The MME starts a timer, to be used in step 7. Step 5. The MME confirms the Path Switch Request message with the Path Switch Request Ack (Serving GW addresses and uplink TEID(s) for user plane) message. If the UE AMBR is changed, e.g. all the EPS bearers which are associated to the same APN are rejected in the target eNodeB, the MME shall provide the updated value of UE AMBR to the target eNodeB in the Path Switch Request Ack message. The target eNodeB starts using the new Serving GW address(es) and TEID(s) for forwarding subsequent uplink packets. Step 6. By sending Release Resource the target eNodeB informs success of the handover to source eNodeB and triggers the release of resources. Step 7. When the timer has expired after step 4, the source MME releases the bearer(s) in the source Serving GW by sending a Delete Session Request message (Cause). Cause indicates to the Source Serving GW that the Source Serving GW shall not initiate a delete procedure towards the PDN GW. The Source Serving GW acknowledges with Delete Session Response messages. If ISR has been activated before this procedure, the cause also indicates to the Source SGW that the Source SGW shall delete the bearer resources on the other old CN node by sending Delete Bearer Request message(s) to that CN node. Could you explain more what you mean in your sentence? "Being honest, now when I'm preparing this article, only reason I can think of using this handover type is preparation of old SGW to software upgrade."